This year’s training for New Mexico History Museum guides attracted more than 40 signups—the largest group in recent memory. 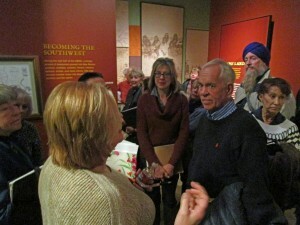 Every Tuesday morning, they gather for a talk on some aspect of New Mexico history, combined with a walk-through of the relevant parts of our exhibits. There, Education Programs Manager René Harris and Educator Melanie LaBorwit note ways to engage visitors by combining the earlier lecture’s lessons with artifacts, maps and photographs. Guest speakers include former Palace Director Tom Chávez and State Historian Rick Hendricks, along with Richard Melzer, Kathy Flynn, Porter Swentzell, and Dedie Snow. Current museum guides and Historical Downtown Walking Tour guides are welcome to attend the lectures for ongoing learning, as are museum staffers (supervisors willing). The free classes began in early November. Upon completion in late April, participants will have deepened their knowledge of more than 500 years of our state’s history and be comfortably prepared to lead groups on tours according to their individual schedules. Some guides end up specializing in Palace tours or History Museum tours. Some drill down on one aspect of New Mexico history, such as the Fred Harvey Company’s legacy or the Manhattan Project. Participants will also be welcomed into the museum guides’ monthly meetings, which include even more talks on various aspects of history and occasional field trips. They earn free admission to the museum. And they join a group of like-minded people who just can’t get enough of New Mexico history.